This post contains spoilers for "XCIV," the latest episode of Samurai Jack. Read our full reviews for the other episodes of Samurai Jack Season 5: "XCII" "XCIII" "XCIV" "XCV" "XCVI" "XCVII" "XCVIII" "XCIX" "C" "CI"
• Jack did not die. Instead, he floated downstream and over a waterfall before hiding out in a cave and allowing the wolf from last week (just as bloody as Jack and also not dead) to nurse him back to health and bring him food. • While he avoided death, visions continue to haunt our hero. Jack once again saw a ghostly samurai off in the distance -- Jack's personal spirit of death? Later in the night, a ghoulish, gnarl-toothed ghostly mirror image of himself taunted Jack over killing one of the Daughters of Aku in last week's episode. He echoed the death wish we've heard before: "Maybe they will kill you. Or is that what you want?" Jack flashed back to a memory of his father the Emperor carving up assassins with his own sword up in front of a young Jack and having to explain why. • Meanwhile, in their search for Jack, the assassins come across deer in the woods showing affection by nuzzling against each other. Trained from birth to be committed killers, they recoiled: "What madness is this?" 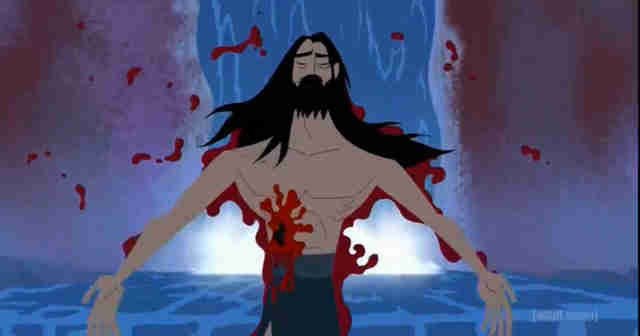 The episode's opening sequence -- Jack floating over the waterfall, surrounded by blood with a knife wound in his side -- continues this season's pattern of Samurai Jesus imagery. We saw it in the first episode with Jack's father, hanging crucifixion-style in the flames of Jack's vision, and it continued with the seven assassins -- an extremely significant number in the Bible -- gunning for Jack's head. Like Christ, the show tempts Jack over and over again: from a burning tree in the forest to ghostly versions of himself that allow voice actor Phil LaMarr to flex some Shakespearean muscle. 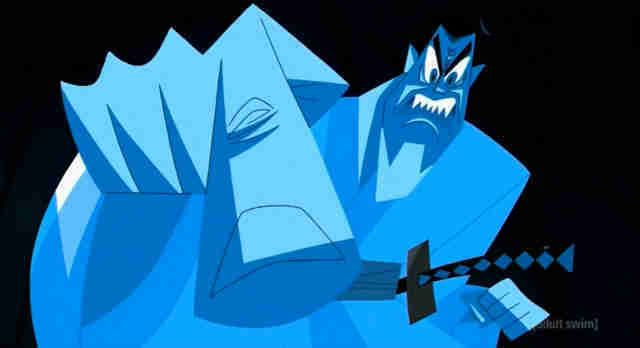 Samurai Jack's early seasons rarely did this, but its best episodes (like the one where Jack fights "Evil Jack") did. The introduction feels less Judeo-Christian and more totemic. Wolves in shamanic traditions can symbolize intelligence paired with instinct, an emphasis on family, and the wherewithal and skill to protect that family. Jack's journey in this episode checked all those boxes too. In saving Jack's life, the wolf reminds him of a middle ground between certain death and his messianic calling as a righteous warrior: survive because others depend on his survival. All these metaphors clarify Season 5's thesis thus far: that Jack can live as a good man while killing the human enemies he needs to. The logic makes sense, with one fatal flaw: Jack needs a foil and doesn't have a great one yet. 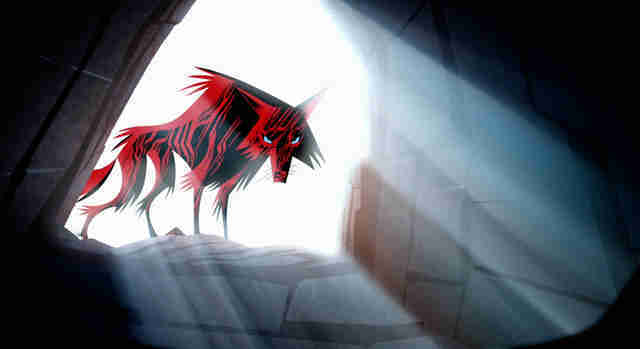 Jack's ultimate foe Aku has shown up in two of the episodes thus far, the first was basically a cameo and the second was a sad introspection from a depressed wizard. 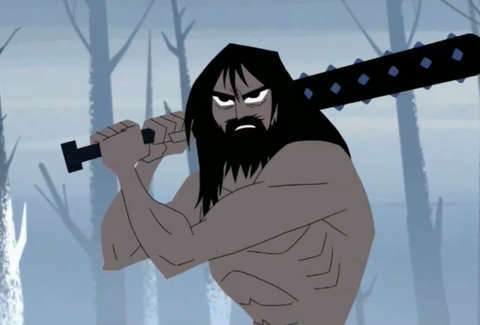 In his absence, we've seen Ashi built up as the de facto leader/spokeswoman of the Daughters, a killer with her own childhood trauma, violence, and point-for-point comparisons to Jack. She and the other Daughters made for interesting opponents, but Jack dropped her off a cliff in this episode after a death rattle that felt straight out of creator Genndy Tartakovsky's Dexter's Laboratory. Watching her fall made me laugh, as opposed to the gut-wrench of Jack's first kill last week. 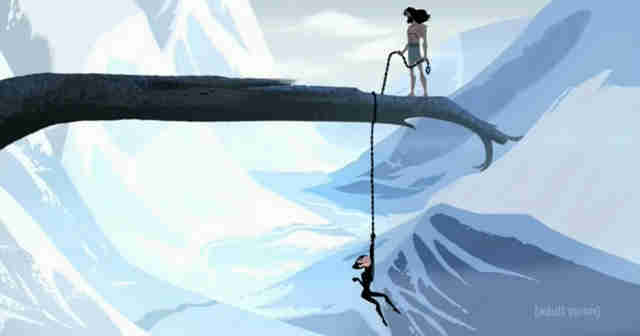 Because ultimately, Ashi doesn't matter -- or she shouldn't anyway. Aku's the Big Bad. Aku's the shape-shifting master of darkness who unleashed the unspeakable evil and flung Jack into the future where his evil was law. Given how much the show built Ashi up, she should live to continue to mix it up with Jack, but his moral grey area would be a lot more fun to probe with Aku holding the bloody scalpel. Luckily Aku voice actor Greg Baldwin has said that he's in seven of the season's 10 episodes. We'll see who's still alive next week. Eric Vilas-Boas is a writer and editor at Thrillist who obsesses over swordsmen too much.